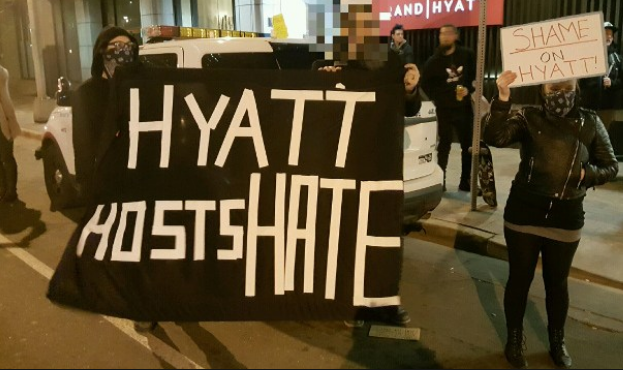 This September, violent white supremacists, neo-Nazis, and heavily armed paramilitary and militia group members are set to hold their annual conference at Hyatt Hotel’s Chrystal Lake location in Washington, DC. Their group, Act For America, is the country’s largest anti-Muslim hate group. Members advocate ethnic cleansing and are responsible for brutal beatings including the vicious attack on the camp counselor in a parking garage during the 2017 “Unite The Right” Rally in Charlottesville, Virginia. If you are now or were ever part of a group unpopular with white supremacists (Black, Jewish, Armenian, Irish Catholic, Latino, etc) you may want to check with your hotel before booking, to see if they are knowingly hosting any groups with murderous intent aimed in your direction. Hyatt's actions are particularly hypocritical given the theme of their latest campaign is "Understanding." Their commercial, released during last year's Oscars, shows small gestures of goodwill being committed by people of different races and creeds. And now this? MoveOn.Org is circulating a petition telling Hyatt to stop hosting hate. You can add your name here.